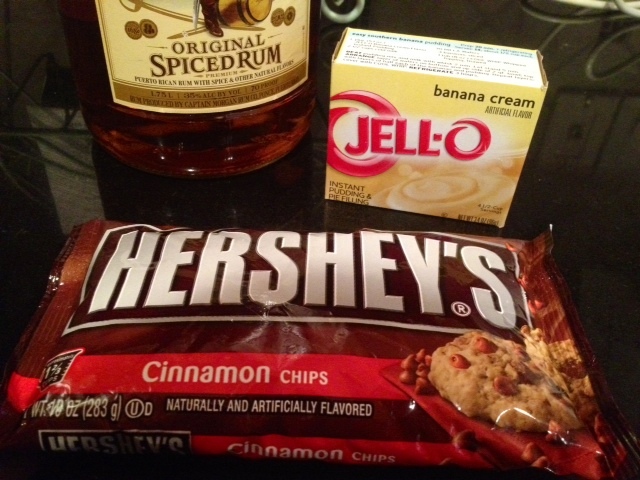 The three key ingredients for this recipe are instant banana pudding mix, cinnamon chips and RUM!!! The cinnamon chips might be a little challenging to find this time of year, depending on where you live and what kind of stock your grocery store carries. My bag had been sitting in my pantry since the holidays (I stocked up when they were easily available). As always, I recommend checking places like Target and Walmart as well. Otherwise, the all-knowing Amazon.com will have them and you can order online. Stock up…because you will want to put cinnamon chips in everything…coffee cake, cookies, pancakes, etc. In terms of the rum, I only used 3 tablespoons – so the flavor is quite subtle. Feel free to add more if you like. You could probably double the amount I used and still have them bake up fine (but with a stronger rum flavor!). I’m partial to Captain Morgan’s spiced rum but use whatever you like. If you have kids or don’t want to include the rum, you can simply leave it out. 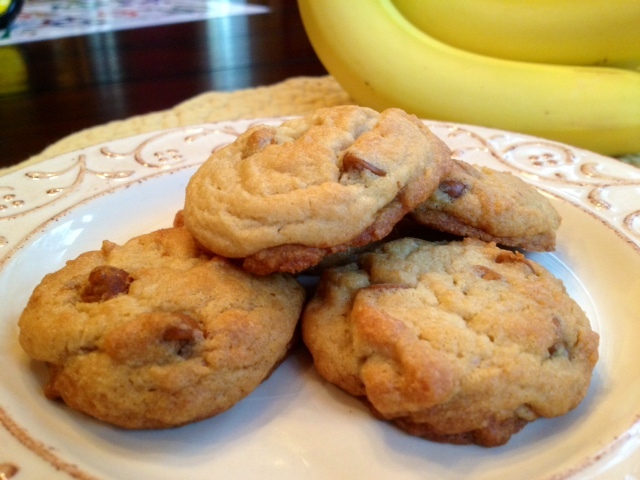 Skip the bananas foster flambe and bake these up instead…enjoy the flavor without the danger! Stir in the cinnamon chips. If you have time, chill the dough for a few hours (and up to overnight) before scooping.